Showing results for tags 'makita'. 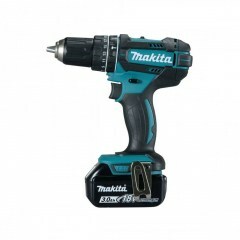 Hi, I have a Makita HP1621F which is a keyless 1/2” hammer drill. It’s a nice drill, but the chuck has finally failed on me. It will tighten, but after a few minutes use it loosens. First question: does this mean I need to replace just the chuck or might the problem instead/also be with the spindle, compression spring, ball bearing, retaining ring or helical gear, all of which have a bearing on the chuck (see the parts diagram at: https://www.ereplacementparts.com/makita-hp1621f-hammer-drill-parts-c-97_16247_1585.html) I’d hate to throw it away for want of a chuck. Unfortunately, the Makita replacement chuck, even on eBay is pricey ($50 new). I don’t want to spend a lot of money on a new part for an old tool which itself has an uncertain life. It’s only worth getting a replacement chuck for not too much money. 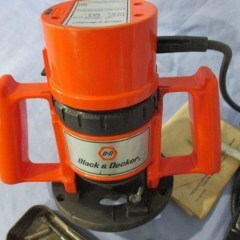 So, I’m wondering if any forum readers could suggest an OEM or other chuck that would work in my Makita HP1621F. Note: the description on the drill itself, describes the drill as a 5/8" drill. However, all the descriptions of the drill I've ever seen (on eBay, for example) list it as a 1/2" hammer drill. The Makita replacement chuck is Part Number: 763192-3. My thanks in advance for your suggestions and help. I will very much appreciate them. Is the voltage a good indicator of battery life? I tested one fully charged 3Ah battery and it showed 19.5V. Another fully charged 5Ah battery showed 19.9V. I don't have a new one to test but I think the "normal" voltage should stay at 4.2 * 5 = 21V. Right? Sharpening experiment for the blade on my Makita Metal cutting circ saw... and it worked! Has any one seen any thing like this before?? its an old Makita 7.2v weed-eater thing.32" long,I haven't had any luck finding it on the internet. I accually found it in the trash, along with a 7.2v drill, charger and two good batteries!! So if any one knows any thing about this, or what it's worth, please let me know! Is EGO 56v platform worth the price in Europe? Hello, I am thinking about investing in a new OPE battery platform. After having spent countless hours reading reviews, watching videos and comparing stuff, I came to the conclusion that the EGO product line would be a solid choice. If I were living in the US, I'd probably be on my way to the local DIY store to purchase the complete tool range. However, here in western Europe, EGO products are a bit harder to come by, they are a recent addition to the market and, more importantly, they are priced surprisingly high in comparison to the US. Put simply, we need to pay a lot more for less. As an example, the typical 190-200$ EGO ST-1500 trimmer would cost you about 240 EUR (~280 USD) and that's only for the bare tool without the kitted 2.5AH battery and charger. The LM2102E-SP mower with 7.5AH battery is about 950-1000 EUR, not doing the math but we understand it's a lot more than 600$, my dad paid this much for a Honda HRX mower. I have compared prices from various stores in Switzerland, France, and Germany, I checked SP-mowers, trimmers and blowers, EGO tools price tag seems to be 180% or 200% higher in Europe, except for the batteries which cost more or less the same. Granted, it's not always fair to compare prices across countries based on the currency exchange rate, but it may be legitimate to ask if EGO products can still be considered great value for money with their cost being above (or at least on par with) well-established brands such as Husqvarna, Stihl or even Makita? There is no easy answer I guess, what's your opinion on this? PS: I am not a native english speaker so please forgive eventual typos or weird grammar. Makita has an interesting battery adapter with a DC plug output. Model number is PE00000028 and it appears to be used by the Makita heated jacket. I was thinking I could use it to power some small electronics, like a soldering iron that accepts a 5.5 mm DC plug and up to 24V. But I can't find anywhere the specs for it. Like what's the output voltage through that plug, and max amp draw, and maybe the type of plug. Does anyone here have the heated jacket with this adapter? Maybe they are printed on it on the other side? Another idea I had is to get this cheap USB adapter: https://www.ebay.com/itm/2A-Blue-Battery-Dual-USB-Charger-Adapter-Tools-for-Makita-BL1830-1430-Adapter/282546633419 Then extract it contents and attach to it my own wires and plug. What do you think? Why is it so expensive?? At least in Europe. The "normal" 240V AC rapid charger is like 40 euro, but the 12V car charger is over 100 euro! And why is it so big? Charging 3.7V batteries from 12V input shouldn't require complicated electronics. And what's up with the "Don't accelerate" sign? All the electronics that I run on the cigarette lighter work fine when i accelerate, but the Makita charger doesn't?! Hey, Seeing some new makita impactx bits on the website. How are these different from the impact gold? step up, step down? How do they compare? A while back we showed you guys the new Makita wireless technology. So what is Makita Wireless Technology? The Makita wireless system uses Bluetooth and talks or communicates between the tool and the dust extractor. When you power up your tool, it will automatically turn on the dust extraction. You can check out more about it on Makita Website. I think this is a pretty cool technology. Not sure how hard it is to turn on your dust extractor before you turn on your tool, but I know there are plenty enough times this will be useful. I like how it takes one more item out of the equation and i don't have to even think about turning on/off the vac. So what do you guys think? Something you think is cool or not? Hey everyone, so here it is. What benefits would you like to have when you buy your tools? 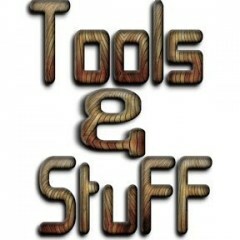 Be it power tools, hand tools, accessories, etc. So far all I can think of is extended full coverage warranty for free by whomever you buy the tool from for power tools, and lifetime warranty for hand tools. What else could you possibly want? Thoughts anyone? Considering that the cells in these batteries allow 20A discharge each, is it safe to use them to jump start a car when needed? I saw a video on youtube where a guy that said he jump-started a truck with a Makita battery! I was thinking to make one out of a Makita USB adapter case. Basically drill 2 holes in it and attach 2 clips to the connectors. Does anyone know what kind of cells do Makita batteries use? I noticed the 4ah battery has the text 5INR19/65-2 text printed on it and the 5ah has 5INR19/66-2. What does that mean? And some say "Made in vietnam", others "Cell made in Singapore. Pack processed in China". What does pack processing mean? Is China bad? And can we find out how many cycles did a battery complete, like on milwaukee? Makita die grinder for an idiot. OK, so I was about to buy a Dremel 4300 with all the accessories line ups, and adapters, all Dremel branded stuff out of the Home Depot, but when I held that tiny 6" ish tool on my hand (demo unit), I really felt like an a-hole. It felt weak, and flaccid. I wish to buy a Makita cordless die grinder with a little more balls, and find a way to use some sort of adapter to use it with the tiny Dremel accesories, and also find a way to regulate the speed of the die grinder itself. Is this even possible? The Dremel doesn't look like it's gonna last, and I plan to re-mod my old Makita radio, and add more USB ports, tweeters, amps, and a higher range Bluetooth adapter using a die grinder to take care of all the molding around the plastic housing to mod it. Also, excuse my mannerism, as English is not my first language, and I still need to get used to all of these nomenclatures (Bolivian-American, please). What is the best tool platform. Debatable but manufactures have there strengths and unfortunatlly have there weaknesses I perfer Makita, Dewalt etc what do you perfer and what are your opinions. Do Makita batteries and charger support balancing? Does anyone know if Makita lithium ion 18V batteries are balanced by the Makita charger?